“Le Guin believes in the ‘necessity of myth for culture’ – for our culture – yet she recognized that traditional myth and traditional definitions of myth, such as Jung’s and Campbell’s, have excluded women as speaking subjects, as heroes, as active – and that this exclusion has failed us. 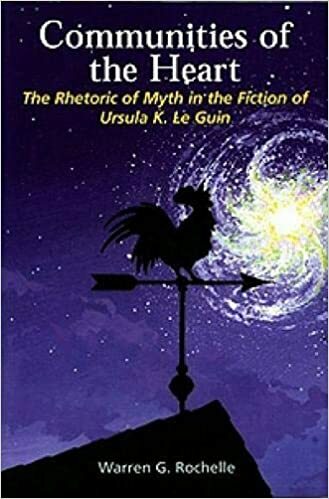 Her ow ‘poetic fabulations’ she offers as ‘part of the process of developing a new mythology for the future.’…Le Guin says myth uses her to reveal its truth, and through her own revisioning and reimagining she revitalizes myth to contain its essential truths and the contemporary reinterpretations of such truths. Her use of myth becomes rhetorical as she argues for an alternative way of seeing, thinking and being that connects rather than separates, includes rather than excludes, gives voice rather than silences. It is worth noting here that the language used by both Jung and Campbell indicates the universality of the myth and its psychological parallel. Gender is not mentioned, but as Le Guin notes in Earthsea Revisioned, the hero-tale, a human universal, is male-gendered: ‘The hero is a man.’ After all, until farily recently, when a writer wrote of anything that was meant to be a human universal, the gender pronoun used to include everyone was male. And as the hero’s quest is typically a public event and on a large scale, little attention, if any, was paid to the small and the personal and the feminine.” …As an ideal, the quest becomes an assumed truth about the human experience of coming of age. Le Guin questions this assumption in her examination of the myth and expands its paradigm to include other kinds of quests, other ways to come of age, particularly female ways.